hookah is a Glass based water pipe device for smoking tobacco , it's known as many popular names water pipe, nargeela/nargile/narghile/nargileh, argeela/arghileh, shisha/sheesha, okka, kalyan, huka, hooka, nargila, argila or ghelyoon or ghalyan. Many of these names are of Arab, Indian, Turkish, Uzbek, or Persian origin. the origin of the hookah is India. 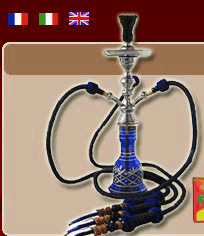 Shisha name is more commonly seen in Egypt, Morocco, Tunisia, Saudi Arabia and Somalia, ghalyoun or ghalyan is more commonly seen in Iran, Narghile is the name most commonly used in Turkey, Lebanon, Syria, Iraq, Jordan, Greece, Cyprus, Albania, Palestinian Territories, Israel and Romania. hookah is most commonly used in English for historical reasons, as it was in India that large numbers of English-speakers first sampled the effects of the water pipe. 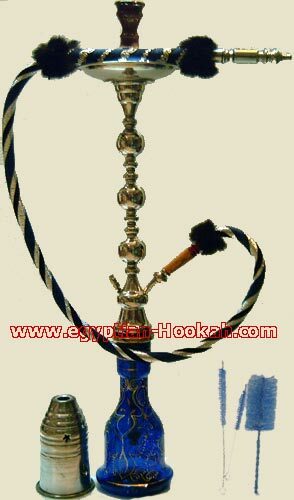 In Arab society, social smoking is done with a single hose, they usually drink Egyptian tea , Egyptian coffee , hibiscus, Or fenugreek "helba" while smoking shisha.